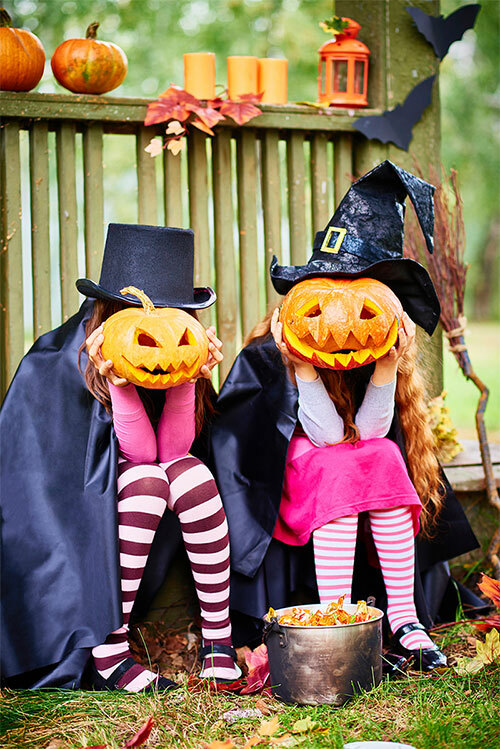 October 31 is, of course, Halloween and it falls on a Saturday this year which is likely to make it more popular among children – if not always with parents! – for the annual neighbourhood round of ‘trick-or-treat’. Nonetheless, it’s a better day for it than the usual task of accompanying the kids door to door on a school night with the attendant issues of getting them wound down for bed afterwards and up for school the next day! What’s more, a Saturday sounds like a fine excuse for a family party with a Halloween theme, and Yuen’s can help you out with some essential supplies for the evening. Of course, it’s frequently said Halloween generally and trick-or-treating especially are a modern American import. However, the historical origins of Halloween are ancient and trick-or-treating actually had its beginnings in medieval England. The word Halloween is a contraction of All Hallows’ Eve, the first of the three days of Allhallowtide and dating back to early Christianity in 609. November 1 is All Hallows’ Day (also known as All Saints’ Day or Hallowmas) and All Souls’ Day follows on November 2. It is regarded a time for remembering loved ones, honouring saints and praying for the recently departed. Some historians say it goes back further to Celtic harvest festivals but others maintain it originated independently. By the 15th century, baking and sharing soul cakes was the origin of trick-or-treating. Groups of poor people, often children, would go door-to-door ‘souling’ – collecting soul cakes in exchange for prayers for the souls of the givers’ friends and relatives. Shakespeare even mentions it in one of his plays. Here is a modern recipe for soul cakes – they’re tasty and easy to make. The door-to-door supplicants would also wear masks or costumes to disguise their identities, which explains today’s costumes, and carry hollowed-out turnip lanterns. During the 1800s in North America, pumpkins replaced turnips because they were plentiful as well as easier to hollow out and carve than turnips. These are, of course, called Jack O’Lanterns. Why not let the kids have a go at making their own? Here are some free templates you can print out. Work with younger children rather than letting them deal with sharp knives on their own and save the hollowed out pumpkin flesh. You’ll be needing that for pumpkin scones (recipe here) and a fun family game to play. And while you’re at Yuen’s picking up a pumpkin or two, better take home some other essential ingredients for traditional Halloween fare as well. You’ll need potatoes and onions for potato pancakes (recipe here) and apples for the time-honoured game of apple bobbing or ducking. In this game, apples are floated in a large bowl of water and the object is to bob down and try to grasp an apple with ones teeth to get it out. Obviously, this requires big adult mouths so why not drop some apple slices in as well so the littlies can enjoy the sweet apple taste of success? Other games traditionally played at Halloween are forms of forecasting the future and in the Middle Ages were regarded as deadly serious. The Scots would predict the name of one’s future husband or wife by peeling an apple in one long strip, then tossing the peel over the shoulder. It was said the peel would land in the shape of the first letter of the future spouse’s name. Interestingly, potato pancakes and apples are Halloween fare because abstinence from meat was traditionally encouraged on All Hallows’ Eve. Vegetarian foods were in for the day, and fruit centerpieces and nuts were also popular. Toffee or candy apples are common Halloween treats made by rolling or dipping whole apples speared with a stick in a sticky sugar syrup, sometimes followed by rolling them in nuts. Here’s a recipe. And what of pumpkin scones and a game? Another common Halloween game is to coat scones in treacle or syrup and hang them on strings. They must be eaten without using the hands while they remain attached to the string. Needless to say, the activity inevitably leads to a very sticky face! As for trick-or-treat being an American import, it’s actually an export from the British Isles, particularly Ireland, to America, then later to the rest of the world. The ‘treat’ was traditionally the soul cakes begged in return for prayers. The ‘trick’ was mimicking mischievous spirits said to roam that evening. Ireland is the only country where Halloween is a national holiday and it was Irish migrants to America in the 1800s who popularised Halloween activities there. Trick-or-treating took some time to catch on with the wider US population and, ironically, it had died out in Britain in the 1930s just as it was taking off in the USA. It was several decades later that trick-or-treat was reintroduced to Britain and, by extension, Australia, due to its depiction in American TV shows and movies. Stone Fruit Season Is Upon Us!